We have a beautiful pitbull mix named Roo (her mom was a Catahoula Leopard Dog/Pitbull). Ever since I knew I wanted a pup from her, I'd been consulting your advice. We eventually bred her in March this year, and over the course of the nine weeks, I followed your advice to a tee. Unfortunately the x-ray performed on day 56 didn't show any pups, though from looking at Roo we knew she had at least ten pups in there (the ultrasound at day 30 had shown seven). It seemed that she started going into labour last Sunday (15) and from then till when she began delivery on Tuesday morning, we stayed up with her, checked temps every two hours, everything. First pup came at 5:40 a.m. and I was by myself. Having had previous experience, I took charge right away. And for a moment Roo's instinct didn't kick in until I showed her what she should help me do. After that, it was amazing. By 11:00 we had nine births, but one stillborn. He was born green, but I still tried for 20 minutes to save him. Then at 11:15, Roo started contractions again. This time, no pup in the birth canal. Nearing an hour, I called the vet to find out if there was any way we could help. She said without a pup presenting, there wasn't much we could do. At one hour and 40 minutes, I called the vet again, because I knew that by now we should've seen some movement. Roo had a few moments of distress trying to get the pup, but otherwise she was good. Nursing and still trying. This time the vet said to give her one more hour, and if nothing to bring her in. So at nearly three hours into contractions, we took Roo in. I had given her calcium but they opted to give her oxytocin, and at that point I agreed. Still nothing after 20 minutes. We moved to ultrasound, which showed one dead puppy, and a couple beating hearts. Time for C-section. We also opted to spay her because she had endured such a difficult pregnancy and was so huge (she weighed about 125lbs by delivery day). We were emotional because we love our precious dog, and really didn't want anything to happen. Here's where things went south. The staff recommended we get some coffee while they got the pups out and put them to nurse. In 30 minutes they called to ask us to come help. When we got there, everyone had a pup. Turns out that the dead pup had dislocated his shoulder and broken his jaw and had died in the birth canal. Behind him were five more big, beautiful healthy pups, but we were told they were all born blue. So everyone tried to revive them. For 45 minutes my husband and I worked with the staff to get these pups. While three of them got pink, and their hearts were still beating, they never took deep gasps on their own, just small intermittent breaths. 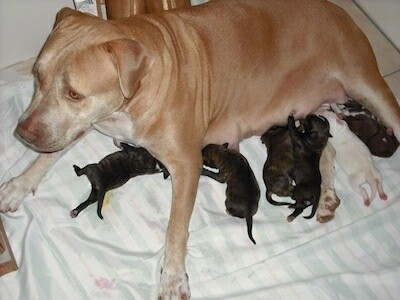 In the end, we lost these five pups. When we went to wait for Roo, we were told that she had lost a lot of blood. The dead pup was touching on a blood vessel apparently and when they moved him, it caused Roo to bleed out. The vets were still working on her, and had decided to keep her overnight. We didn't get to see her. As we drove home, with six dead pups in hand, my husband and I could not overcome the sheer grief that was taking place. This was the first time Roo was away from home. She was gravely ill, and may not recover because of a pregnancy we put her through. At home, more grief as we shared the news with our family, and as we buried the seven pups (six from surgery plus the stillborn at home). I knew from what you wrote that the nightmares could happen. I just never thought that it could happen like this. 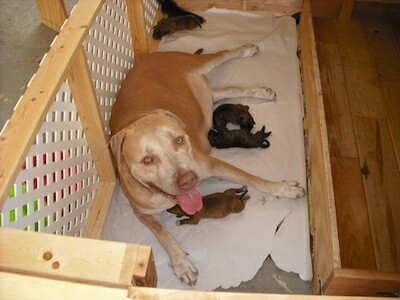 That night as we nursed the pups, we were happy for them but grieving for Roo. No sleep, but thankfully at 6:30 a.m. the vet office called to say that Roo's colour returned and she was alert, awake and responsive! 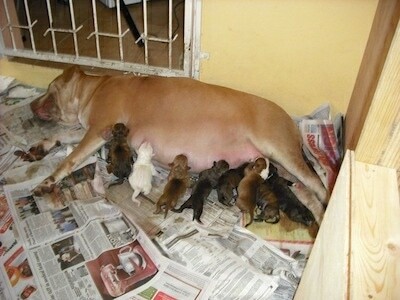 Later that morning, we brought her home and she took to nursing and caring for her pups like a pro! The pups are now five days old, and putting on weight. Roo is still trying to catch herself, and I am monitoring her very closely. I would like to give her some supplements besides the iron the vet gave, and the calcium I am giving once a day (I think I would collapse if eclampsia were to set in). She is also still looking for the other pups, and is still trying to create a nest. I am trying to move her past this stage, but just have no clue how long it might take. Finally, I just want to say a BIG THANK YOU for all your great advice! I am still blaming myself somewhat for not moving to the vet earlier, but as my husband reminds me, Roo was not in great distress, and the pups were still alive just minutes before surgery. I just wish all had gone well, but am thankful that because I carefully studied your advice, I was able to successfully birth the eight living pups. In time, we will get over the lost seven, and we are just so happy that Roo is home and is slowly recovering. We hope that all will continue to improve, and I want to wish you both continued success with your breeding. Thanks again for your tried and proven advice!